What Do You Think Steve Jobs&apos; "Blood-Curdling" First Name for the iMac Was? 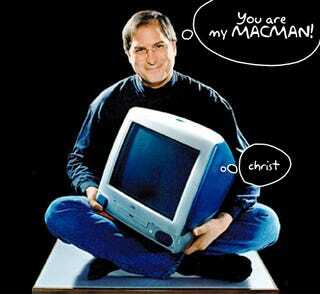 Our sources claim that the name that Steve Jobs wanted was... MacMan. At the time, the name was being used by another company, called Midiman. They manufactured the MacMan, a serial-to-MIDI adapter with one input, three outputs, a serial passthrough switch, and MIDI indicator LEDs. According to this account, Apple came to them with an offer for the name, but Midiman's owner thought they didn't offered enough ruby rupees. He declined Apple's offer. If this is true—and it rings real to me—I'm glad the owner declined. Just imagine if they called that bondi blob the MacMan. We would still be hearing the echoes of the worldwide laughter. For the same reasons, I hope they don't go with Apple iSlate (Apple Is Late?). It's not as bad as MacMan, but it's almost there.